The vast majority of movie tie-ins are rubbish. But Frontier Developments and Universal are here to buck that trend. How do they go about it? Well, giving us access to the wonderful world of Jurassic Park is always a good start. 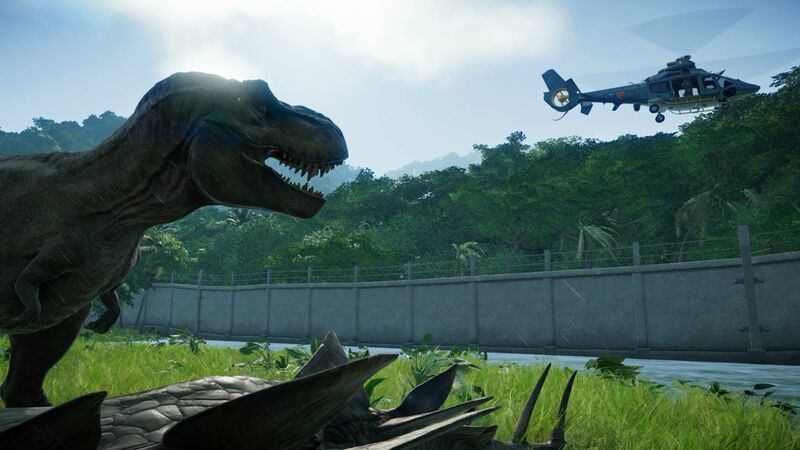 Jurassic World Evolution has been billed as the next chapter in the official Jurassic mythology, as it attempts to cash-in on the excitement and appeal of the Jurassic World universe to put us in charge of the most famous park in the land. And it is by going hands on with everything that the legendary islands of the Muertes archipelago can muster, do we get the chance to bioengineer dinosaurs, deliver entertainment to the crowds and keep on top of security, all while playing with life itself in the best possible way. 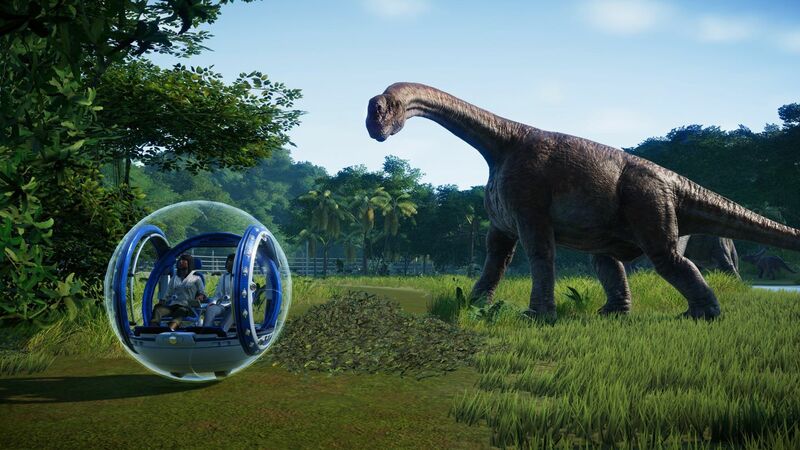 Jurassic World Evolution plays out very much like any other city builders in which we slowly get drip-fed new and exciting opportunities, all with the express intention of making money and expanding our world. This is done by completing missions, hitting objectives and visiting, and harnessing, the land of all of the islands that make up the archipelago. You may for instance need to build a fast food joint in order to keep your park visitors happy, or build them a hotel in order to see visitor numbers increase. But you will need to keep an eye on power supplies, and pathways to new buildings too, because with neither of those of suitable quality, the paying public won’t be happy. You’ll also need to concern yourself with environmental hazards and weather effects, with each of the various islands providing a different test from the next. For all the entertainment opportunities in the world though, for a Jurassic Park to thrive, dinosaurs must be the star attraction. Thankfully Frontier haven’t skipped on that front with a huge variety of dinos available to keep the public entertained. In fact, whilst 42 different types may initially seem a bit tight, there is a great mix of the big, the small, the docile, and the fierce, to ensure you will want to experience everything on offer. You’ll have to bioengineer them first though, and that means sending archaeologists off to dig sites across the globe in order to find fossils with enough DNA to allow for growth. From there that DNA will have to be extracted from the rock and refined enough for your best scientists to gather the genomes required for life to begin. 50% is all that is required in order for you to start any incubation period at the world renowned Hammond Creation Labs and to start filling your parks with attractions. For all this to happen though, you’ll need to ensure you have the relevant building types in place. Without them, life will quite literally ground to a halt. Throwing new dinosaurs into pens and forgetting about them isn’t the way to go about things though, and you’ll need to consider which dinosaur types work well with others, the type of pen features and food you will give them, and even more in order for the beloved beasts to be kept happy. A wealth of information is at hand luckily, giving you an insight into the requirements of each species, and you’ll want to utilise that knowledge too…. for if they are not happy, then your park security will be at risk. This is the third element of Evolution and one that you’ll need to pay strict attention to in order to make the most money. See, for as fun it is for us gods to watch a Velociraptor or Ceratosaurus cause chaos after escaping, the park public don’t generally enjoy being eaten alive. That means you’ll need to employ park rangers and helicopter trained sharpshooters who are all ready and willing to fix any holes in fences, or to make general repairs to the buildings in your park. These guys will also need to administer medicine, take down rogue dinos and remove the bodies of those animals which have passed on. You won’t ever want to underestimate the importance of the rangers, especially once you’ve taken a more hands on approach to matters – driving jeeps, flying copters or taking charge of the tranquilizer gun are all possible. At the end of the day though, Evolution would struggle to stand out from the crowd were it not for the addition of the Jurassic World franchise that had been so brilliantly integrated in. There is real joy when you sit back and watch the cutscenes showing your first dinosaur entering the park, and that doesn’t abate for a good while after. With the herbivores making up the backbone of any attraction, and then the likes of the iconic Velociraptor and frilly Dilophosarus bringing a little more of a test to proceedings, you’ll welcome the arrival of each animal with open arms… no more so than when you extract enough DNA from various fossils to see the king of all – T. rex – populating your most secure pens. You don’t have to be content with just using the standard historically accurate beast types either and the options are in place to let you create your very own monster by altering the genomes slightly, plowing cash into research and amending DNA traits as you so wish. 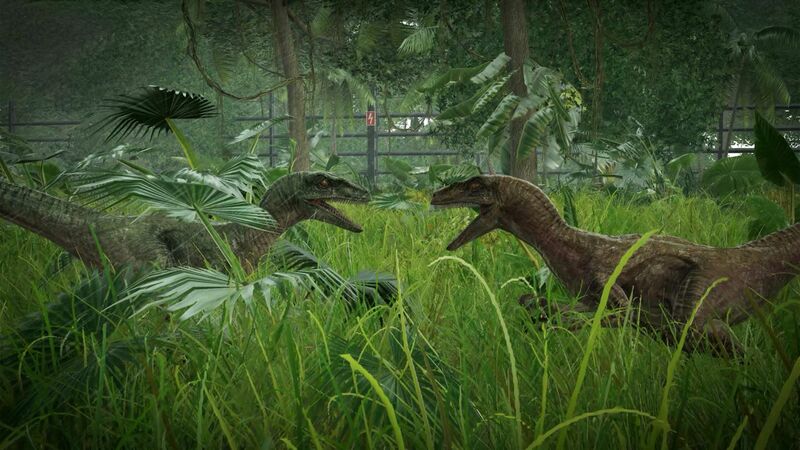 This is where the real fun in dinosaur breeding comes about, but for as good as Jurassic World Evolution is, like any good city builder – and let’s be honest that’s basically what this is – there is a big old grind involved for anyone wishing to experiment with every last island, building, idea or dinosaur. For the most part, it’s a good grind that rewards those who decide to put huge attention to detail into how the park is laid out, however this could be a bit of a turn off to many, especially those who just want to raise their favourite animal from the get go. But hey, creating life was never going to be easy! There are other issues, mostly revolving around the poor rangers who frequently get stuck on hills or decide to take their jeep for a swim in the local lake when surrounded by gigantic beasts, but thankfully these problems don’t ever centre on building placement or ease of use. See, many builder types may seem to be more at home on PC, but Frontier have done a remarkable job in ensuring that the user interface in Evolution is straightforward to use, even more so once you get to grips with exactly what is required of you. Quick flicking between units is a cinch and keeping tabs on every dinosaur that you allow to roam your parks is easy thanks to a brilliant management overview. 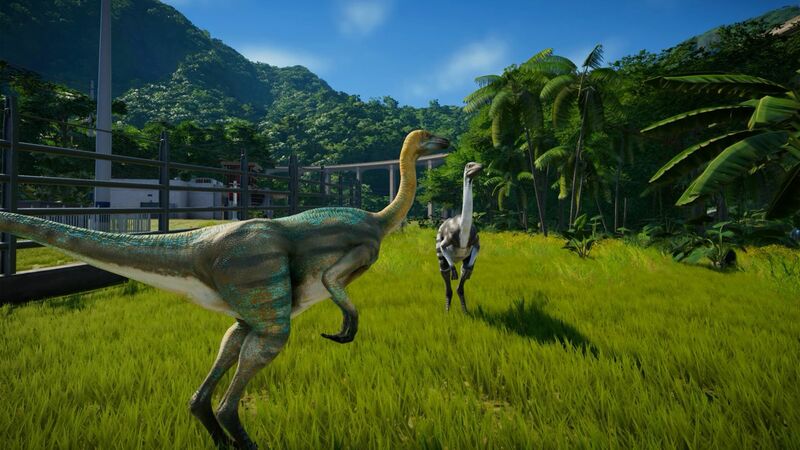 Some may see Evolution as just a fancy looking Zoo Tycoon, and they’d probably be right, but when you throw in some brilliant visuals, a huge amount of Jurassic Park lore, cameos bringing in the most famous characters from the big screen flicks, and that music, you’ll quickly understand how Jurassic World Evolution is much more than that. The opportunities available to visit the park that kicks it all off – Isla Nublar – in the unlockable Sandbox Mode just ensures that those who wish to find time to keep heading back to Eovlution in order to experiment will nearly always have a reason. It is however a massive shame that there is no form of multiplayer present, as it is just calling out for a bit of cooperative park building. That said, this isn’t just a great dinosaur game, it’s a great city builder too and should Frontier find it within themselves to be able to add further scenarios, a few more building types and, most importantly, more dinosaurs, then Jurassic World Evolution will continue to thrive. Not all movie tie-ins are rubbish you know.